While planning a family vacation recently, I started to worry about the cost of admission to places adding up. 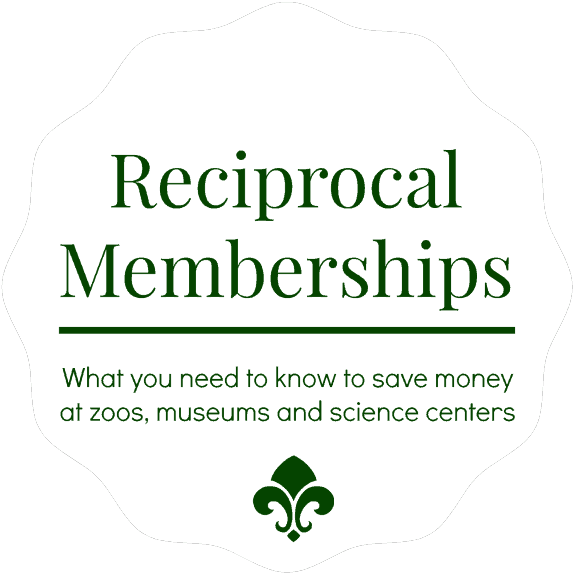 Then I remembered reciprocal membership benefits for museums and zoos. I’d read about it elsewhere (Odyssey Through Nebraska and So Cal With Kids) but I hadn’t really took note until now. We’re members to the Omaha Children’s Museum and Omaha’s Henry Doorly Zoo & Aquarium, but I hadn’t ever considered if those memberships got us benefits elsewhere. They do. And sometimes, those memberships can get us into places for FREE. It’s a pretty sweet deal when planning trips with kids. All these reciprocal programs listed below recommend you call ahead, since perks depend on the location and, simply, change. Find members of the Association of Zoos & Aquariums here. Members of the Omaha zoo get 50% off admission to many zoos around the country. *Please note that these lists of participants may change from year to year so double check before traveling to one. Riverside Discovery Center in Scottsbluff, Neb. Check out the museum membership perks here. Members get discounted admission to more than 250 science and technology centers across the country thanks to the Association of Science and Technology Centers (some unfortunate exclusions include any science centers and museums located within 90 miles of the science center or museum where you are a member or withing your residence). It’s always good to call ahead to see if your membership will get you a discount. Participants on the list may change from year to year. Exclusions apply, so if your home museum or your residence is within 90 miles, you may be excluded. Edgerton Explorit Center in Aurora, Neb. Hastings Museum, Hastings in Neb. University of Nebraska State Museum of Natural History in Lincoln, Neb. Patron members at Omaha Children’s Museum also receive discounts to participating museums that belong to the Association of Children’s Museums. The discount is typically 50% off admission for up to six people. The museums in Nebraska that are also belong to the Association of Children’s Museums include Lincoln Children’s Museum and Kearney Area Children’s Museum. The museums in Iowa that also belong to the ACM are LaunchPAD Children’s Museum in Sioux City; Felix Adler Children’s Discovery Center in Clinton; Family Museum in Bettendorf; The Iowa Children’s Museum in Coralville; and Phelps Youth Pavilion in Waterloo. I know what you’re thinking – admission is FREE there already, why get a membership? There are definitely perks to a membership (beyond the satisfaction of support a great institution). One perk is getting you FREE admission to 687 other museums if you get the Contributing Membership or Patron Membership, as well as discounts to those museums’ gift shops and concert/event tickets. See the full list at North American Reciprocal Museums’ website. Where does your Joslyn membership get you benefits in Nebraska and Iowa? It’s always good to call ahead to see if your membership will get you a discount. Participants on the list may change from year to year. Check the member list of the American Alliance Museums (it changes annually) before you visit a new place – it might offer reciprocal membership benefits. For instance, I found out – after the fact – that our Omaha Children’s Museum membership gets us in for FREE to University of Nebraska State Museum of Natural History (Morrill Hall) in Lincoln. Here are the Nebraska member sites (not all offer reciprocal benefits): Knight Museum City of Alliance in Alliance, John G. Neihardt State Historic Site in Bancroft, Chimney Rock National Historic Site in Bayard, Mari Sandoz High Plains Heritage Center Chadron State College in Chadron, Fort Robinson Museum in Crawford, Trailside Museum of Natural History in Crawford, Legacy of the Plains Museum in Gering, Stuhr Museum of the Prairie Pioneer in Grand Island, Hastings Museum of Natural and Cultural History in Hastings, Phelps County Museum in Holdrege, Museum of Nebraska Art in Kearney, Buffalo County Historical Society in Kearney, Dawson County Historical Society (history museum) in Lexington, Sheldon Museum of Art University of Nebraska-Lincoln in Lincoln, Thomas P. Kennard House in Lincoln, University of Nebraska State Museum of Natural History (Morrill Hall) in Lincoln, International Quilt Study Center & Museum in Lincoln, Senator George Norris State Historic Site in McCook, Neligh Mill State Historic Site in Neligh, Joslyn Art Museum in Omaha, Bemis Center for Contemporary Arts in Omaha, Omaha Children’s Museum in Omaha, Durham Museum in Omaha, Ashfall Fossil Beds State Historical Park in Orchard, and Willa Cather State Historic Site in Red Cloud. If you’re a supporter to Nebraska Statewide Arboretum in the University of Nebraska-Lincoln, you get discounts to about 300 gardens around the country that belong to the American Horticultural Society. Two on the list that we’ve visited and I highly recommend visiting is Botanica, The Wichita Gardens in Kansas and Missouri Botanical Gardens in St. Louis. Thank you for this great information! Unfortunately, the link “Association of Zoos & Aquariums” is not working. Whoops! Thank you, Sara. I fixed the link! We visited the Lincoln Childrens Museum last month and asked for the reciprocal price, since we are members at OCM. They said the only discounted price they give now is for Lincoln Zoo members. Good to know, Jill. I’ll update the post…since I see some others no longer are members of the same ASTC program.